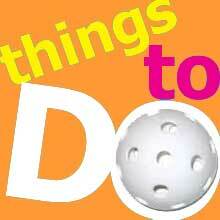 Happy Trails Pickleball Club uses and maintains 14 dedicated pickleball courts. 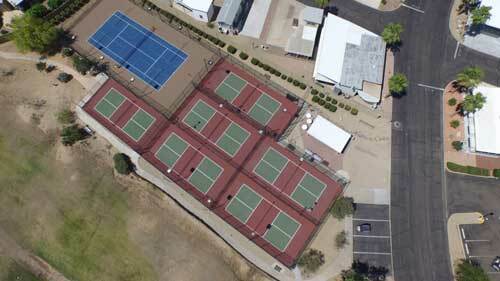 All of our courts conform to USAPA standards and are located at the Happy Trails Cascade Center and Town Center areas. Court time for usage may be scheduled by members and residents. See HTPC Rules for more information. Court is open to use by only HT Pickleball Club members, HT residents and their overnight guests. Court Usage Rules apply to On-line Sign-up and manual, same-day sign-up at the court. 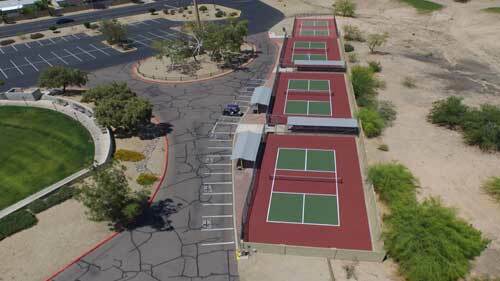 Court is open to use by only HT Pickleball Club members, HT residents and their overnight guests. First pickleball court on the right as you enter the back courts gate. Court Usage Rules apply to On-line Sign-up and manual, same-day sign-up at the court. Court is open to use by only HT Pickleball Club members, HT residents and their overnight guests. Second pickleball court on the right as you enter the back courts gate. Court Usage Rules apply to On-line Sign-up and manual, same-day sign-up at the court. Court is open to use by only HT Pickleball Club members, HT residents and their overnight guests. First pickleball court on the left as you enter the back courts gate. Court Usage Rules apply to On-line Sign-up and manual, same-day sign-up at the court. Court is open to use by only HT Pickleball Club members, HT residents and their overnight guests. Second pickleball court on the left as you enter the back courts gate. Court Usage Rules apply to On-line Sign-up and manual, same-day sign-up at the court.